Lester Slate was inspired by former president George H.W. Bush's 85th birthday jump. PITTSFIELD — A Maine man who learned how to use a parachute as a Navy pilot during World War II has finally made his first jump — at age 90. Lester Slate of Exeter jumped out of a plane for the first time on Sunday at Pittsfield Airport and was guided to the ground by a tandem jumper, and accompanied by another skydiver trailing a U.S. flag. 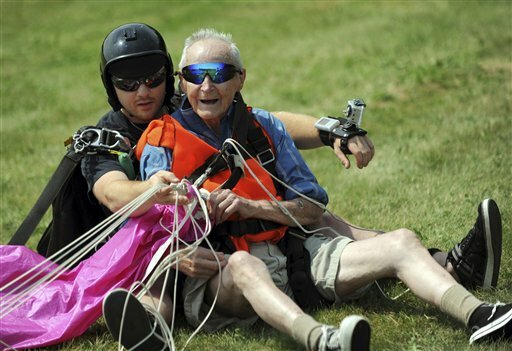 The jump was a 90th birthday present to himself. More than 50 family and friends watched. Slate tells the Bangor Daily News he was inspired by former president George H.W. Bush, who jumped from an airplane on his 85th birthday in 2009. Slate says he had such a good time he wants to do it again — on his 95th or 100th birthday.